Edna Margaret Hinson Froehlich, passed from her life on earth as the clouds parted and the heavens lifted her up on warm rays of sunshine, to join her beloved husband for eternity on Wednesday, August 8, 2018. Margaret, as she was known to all, was born March 8, 1930 in Meridian, MI. As a young red-haired girl she moved with her family to Houston, Texas, her home for the next 30 plus years. In her teen years at Milby High School in Houston, she met her true love Marion Ransom Froehlich. The two eventually married on February 15, 1952. 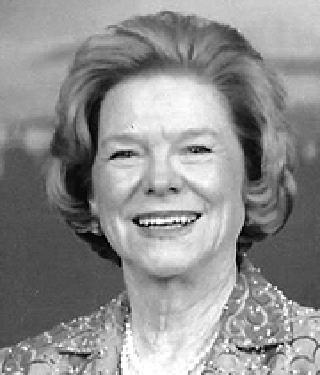 Margaret attended Lon Morris College in Jacksonville, TX, where she studied theater, then worked for a brief time in downtown Houston before she became a devoted wife and mother to three children. In 1973 she and Marion packed up their possessions, their kids, and their Texas lives, moving to London, England for a new work opportunity. In London, Margaret not only adapted quickly to her new surroundings but thrived on the new lifestyle she found in a foreign county. After nearly a decade in London, she and Marion moved back to the US, landing in Bartlesville, OK. Once again, she fit in quickly and easily into her new home. It was in Bartlesville where she welcomed her two new grandchildren. Margaret transitioned gracefully from wife to mother and grandmother, "Granny". After Marion's retirement, the two moved to Colorado Springs to be near their oldest child and only daughter Karen. Both their sons would eventually move to Colorado as well. Happiness and heartache would follow as Margaret took to the mountain state quite comfortable, then lost the love of her life Marion in 1997. Friends and family were most important to her as she built a new life, and she continued to spread her love to all with whom she came into contact. Throughout her life, she made time to pursue her many passions, including theater and painting. In the years after returning from London, she would periodically take on leading roles in the community theater productions as well as presenting her unique one-woman "book reviews." Following Marion's death she devoted much of her time to painting, working to perfect her craft with various artists including renowned Colorado Springs artist Herman Raymond. She loved spending time with her friends, playing bridge, traveling, or just visiting and enjoying their company. Margaret was preceded in death by her parents, Arthur and Lona Mae Hinson; three sisters, Mary Louise Hinson, Lorena MacDonald, and Flora Belle "Skeeter" English; and her beloved husband and life partner, Marion. She is survived by one sister and brother-in-law, Bettie and Don Edwards of San Antonio, TX; daughter, Karen and her husband Tom McCarver of Colorado Springs, CO; son, Phillip and his wife Joellen of Colorado Springs, CO; son, Scott and his wife Monica of Lakewood, CO; two grandchildren, Travis Froehlich of Colorado Springs, CO and Andrew Froehlich, of Denver, CO. Margaret was also a much-loved aunt to many nieces and nephews, great nieces and nephews and too many dearly loved friends to list here. All those she touched were forever changed by her caring nature, her intelligence, and her quick wit and her unequaled and devoted love. We all celebrate her life with her passing. Services will be held at First United Methodist Church in Colorado Springs on Tuesday August 14, at 1pm. made to Rocky Mountain Multiple Sclerosis Center, in Englewood.